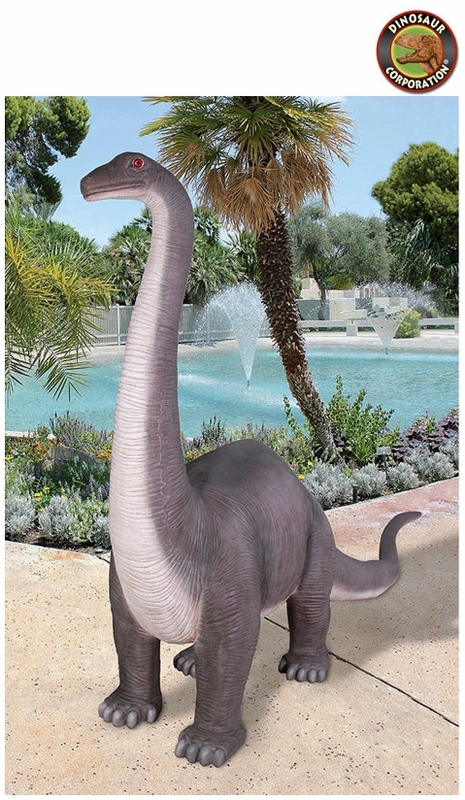 Home | STATUES | Brontosaurus Prehistoric Garden Dinosaur Statue 151"
Brontosaurus Prehistoric Garden Dinosaur Statue 151"
Our most spectacular outdoor sculpture EVER wandered in from the Jurassic period! Larger-than-life and equally dramatic, our seven-foot-tall sauropod is head-and-shoulders above all other garden sculptures we've ever offered! Our artists captured every detail of this attention-demanding beast, then cast it in high-quality designer resin and hand-painted it with utmost authenticity. Though the brontosaurus originally fed in the grasslands, our sure-to-impress fellow is just as happy lounging next to your pool, feeding along your garden path or peering over your neighbor's fence. Nothing short of amazing, our imposing signature piece will have guests talking non-stop about this exclusive Jurassic giant! For easy assembly, ships in 4 pieces. Bring inside during freezing temperatures.